OUTSTANDING: Dr. Christina Kishimoto, Gov. 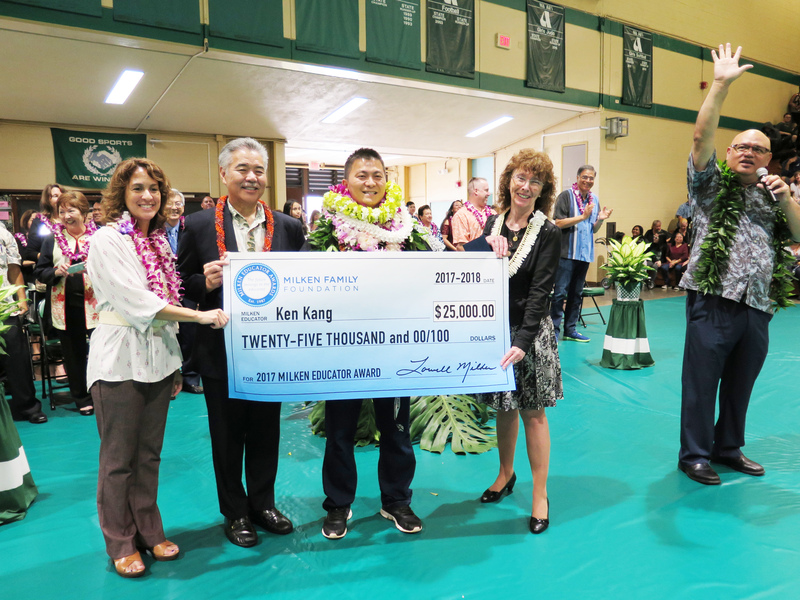 Ige and Dr. Jane Foley congratulate ‘Aiea High STEM teacher Ken Kang as Hawai’i’s 2017 Milken Foundation winner. School loyalties run deep in Hawai‘i — from small-kid time to the University of Hawai‘i system. 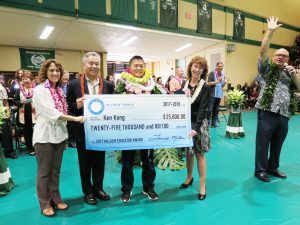 As a proud graduate of Pearl City High School and UH Mānoa, Governor Ige has made education a top priority throughout his legislative career and now as governor. This issue of Capitol Connection highlights some of the progress and investments we’re making in this critical piece of the state’s future. Q. Why have you made education one of your top priorities and how does that build on what you tried to achieve as a legislator? A. I’ve always believed our schools are the foundation of our community. The strength of our state’s economy depends on the quality of public education and the opportunities we create in the workforce. When I was House Education Chair in the Legislature, Sen. Mike McCartney and I introduced an omnibus education bill in 1993 that became law, giving public schools more control over their own resources and encouraging innovation. It was considered a landmark piece of legislation because it provided schools with more of the tools they needed to improve. Now, with Hawai‘i’s Blueprint for Education and our new DOE superintendent, Dr. Christina Kishimoto, we’re refocusing on empowering schools in a grassroots way. Q. What education accomplishments are you proudest of so far in your administration? What budget items are being requested? A. Much of what we’ve done has been to improve student learning and expand opportunities for college and careers. Cooling more than 1,200 of our hottest classrooms was a promise we delivered on, thanks to support from the Legislature and energy-efficient strategies from the DOE. I got involved with the negotiations for a new four-year teachers’ contract and pay raises because it was a way to let them know their commitment to their students and communities was appreciated. My budget requests this session include more funds to help schools close the achievement gap, expand Early College in the high schools and provide more funds for the Hawai‘i Promise scholarships for UH community college students. A large share of the state’s capital improvement funds is earmarked for projects to improve public school and UH facilities statewide. And we’ve also requested funds for the Hawai‘i Keiki program for school-based health services, the Farm to School program and Sen. Michelle Kidani’s “Grow our Own Teachers” initiative. Q. What are some of your main concerns regarding school safety and preventing gun violence? A. I’m proud of our students who are lending their voices to issues of safety and security on school campuses. We’re working with law enforcement officials, the Board of Education and Superintendent Kishimoto to review school safety plans. Hawai‘i already has a zero tolerance policy for weapons on campus and some of the strictest gun laws in the nation. Q. What were some of the biggest issues discussed at the 2018 National Governors conference in Washington, D.C. ? A. School safety and preventing gun violence were big topics, but it remains to be seen what may be done at the federal level. It’s clear the president believes the governors and states will lead. However, I don’t agree with the president about arming teachers. Teachers are there, first and foremost, to help our children learn. A lot of my time in Washington involved meeting with agency officials about dramatic federal budget cuts for housing, homelessness and the environment. The governors were also concerned about proposed cuts for maintaining highways. The general consensus among the governors is that, although the Trump administration can propose these reductions, Congress can moderate them.